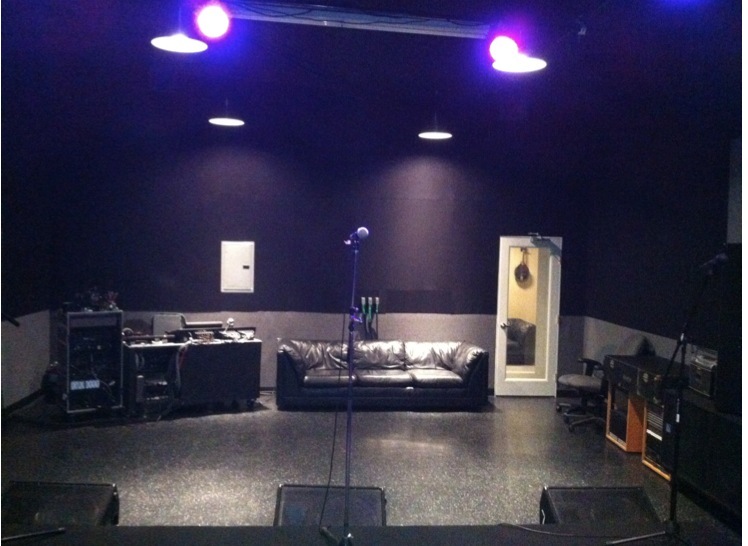 This is a multi- purpose facility the is perfect for Recording, Band Rehearsal, Video Shoots, Photo Shoots, Webcasting, etc. The Room Measures 22’ X 33’ for a total footage of 726 Sq Feet. Ceiling height is over 12’. There are 300 amps of power including cam-locks, schedule 40 ceiling mounted pipe for lighting. 4 Tons of air conditioning. Also available is an in-house 6900 watt QSC/Cantora Pro PA system with 2 side fills, 4 floor wedges, 32 input Yamaha LS9-32 mixing console which can output to an additional 5 pairs of stereo in-ear monitoring. The mic panel is routed both to the FOH console and also to a patch bay in the Jungle Room Control Room for recording purposes. The Stage has its own lounge. Internet access is free. Ample street parking and a limited amount of off street parking. There are loading access double doors measuring 7’ X 7’. The driveway access doors measure 3-1/2’ X 6.5’.